Try InLoox now! for Free! InLoox PM Web App makes it easy to involve mobile and freelance team members in current projects. No matter where your team members are located, they can easily access up-to-date project data and work on all project tasks at any time. Our online project management solution is fully compatible with InLoox PM for Outlook, offering even more flexibility for you and your team. You decide whether you would like to accesss your project database exclusively via web-browser or add the access option through Microsoft Outlook. No matter what option you choose, your project data is always in synch, giving you real-time transparency and project control. 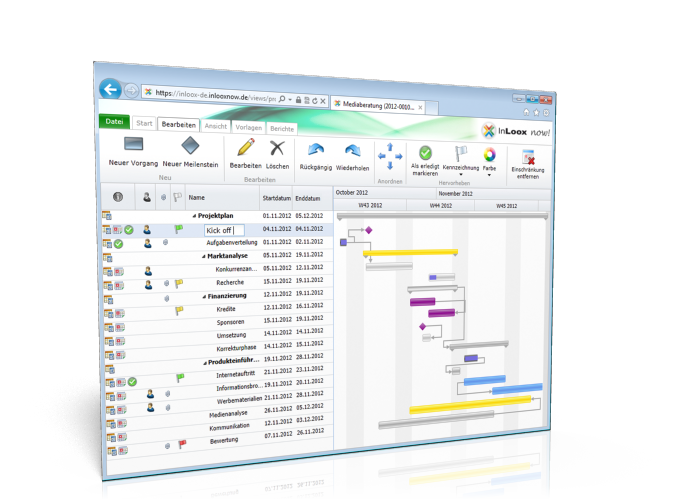 Project planning: Get an overview of tasks and resource capacities with graphic reports. Time tracking: Immediately capture work hours for current projects, facilitating a complete documentation. Document management: Manage project related documents in a virtual project space through the internet and prevent duplicates. Independence: InLoox PM Web App runs platform- and device-independent and is executable with multitude of web-browsers. InLoox PM Web App is available as SaaS; with the turnkey project platform in the cloud you can immediately start planning and managing your projects without any software installation. Additionally, the online project solution is also available as an on-premise download version - you choose which usage model fits best your needs. More than 3,500 customers and 45,000 users on five continents and in over 50 countries worldwide rely on InLoox PM. Many blue-chip corporationsworldwide run on InLoox. Our customers are companies of all sizes and from all sectors of business. Business sectors as different as telecommunications, engineering, banking, manufacturing and processing industry, health, public administration, business consultants and agencies - to name just a few - use InLoox PM every day: a reliable, state-of-the-art solution for efficient project management. Well-known companies such as AVIS, Siemens, Pentax Europe or US Airways are - beside many others - among our customers. The project management software InLoox PM is tailored to the daily challenges and the everyday routine of project management. Inspired by the suggestions of our customers, we are constantly evolving our project management software and adjusting it to the requirements of modern project management. Follow these simple strategies to make your e-mail management more efficient. Project management online | InLoox.com • Copyright 1999-2019 © InLoox, Inc. All rights reserved.